The PADI Open Water Course is the world’s best and most popular entry level course into the underwater world of scuba diving. Once the course is completed you will be qualified to dive to 18m with a globally recognised certification that is valid for life. The Open Water Course is split into three sections: theory, pool modules and open water dives. The theory sections are based on home study allowing you to learn at your own pace. The modules are supported and reviewed by sessions with an instructor who can explain any areas in more detail. During the five pool modules you will learn the skills to dive safely. The four open water dives allow you to demonstrate the skills that you have learnt during your pool modules in safe natural environment. 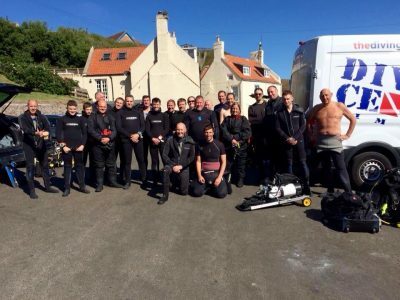 The open water dives are completed, weather permitting along the North East Coast, or alternatively during weekend trips to the West Coast of Scotland. Firstly we have some of the best facilities in the country. 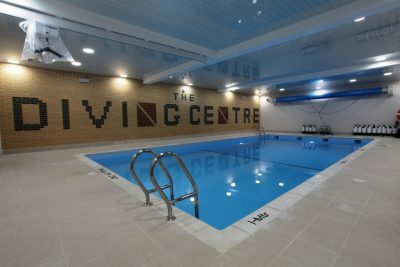 With our onsite heated pool (30 degrees), classrooms and large car park. There isn’t anytime wasted going between the shop and local swimming pools. We only used high quality and well maintained diving equipment in the school, with separate equipment for both pool and open water training. We are also the longest running diving centre in the area with over 35 years membership with PADI. 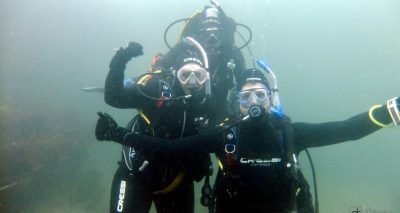 Our instructional team are highly experienced and passionate about diving. We make it our goal to train in the sea and not in fresh water. We also encourage our students to continue with us after their course with reduced rates for kit hire, warm water diving holidays and an active social scene. Same as the standard course but you complete the course in our high quality school drysuit which will give you extra warmth and comfort in and out of the water. This includes pool orenetantion and hire of suit. This gives you the option to completely tailor the pool session of your course to a time schedule to suit you. This can be done as an intensive course over two days or spaced out longer. With the open water sessions done on our standard Saturday morning training dives.